1. Did you date someone from your school? Yes, I always had a boyfriend and generally they were from Alta. 2. Did you win anything in Senior's Who's Who? We didn't have that but I would have won several awards. Hahahahaha! 3. What kind of car did you drive? I drove a 98' Volkswagen Beetle. 4. It's Friday night...where are you? At a football game performing or hanging out with my friends. We liked to go power boxing and turn off people's power. We also liked to visit haunted places. Or hanging out with Cameron and Landon. We liked to watch WWF! 5. Were you a party animal? Not in high school. 6. Were you considered a flirt? Maybe. I wasn't good at it though. I was just funny and loud and people probably just thought I was annoying! 7. Were you in band, orchestra, or choir? No. 8. Were you a nerd? Well........ I loved to study so that made me a nerd. I love learning and doing projects. But to the average nerd, probably not. 9. Did you get suspended/expelled? No. But in Middle School I did get kicked out of seminary. Rebel! 10. Can you sing the fight song? Nope. I used to know it! 11. Who were your favorite teachers? I loved Mrs. Lunak/Goodmansen. 12. Where did you sit during lunch? Usually at the first table by the book store. 15. Did you go to Homecoming and who with? Yes and I went with Devin Rasmussen. It was a great date. We had tons of fun! 16. If you could go back and do it again, would you? I would. But only if my husband could go to. He would have been such a fun date at our dances. 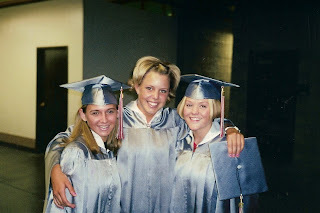 I don't have any regrets from High School and would do it again any day! 17.What do you remember most about graduation? It was crazy long! And ewwww I know but I kissed Ricky Martinez as we were walking out. We promised we would and I couldn't turn him down. I loved Ricky! I also remember Ricky's dad yelling "GO RICKY"! It was hillarious. 18. Where did you go senior skip day? I don't know. I skipped though. 19 Were you in any clubs? Drill team and FCCLA. 20. Have you gained some weight since then? Yep. Butts are in now. I had to keep up with the times. Hahahaha! 21. Who was your prom date? I didn't go to Sr. Dinner Dance. One of the cons of dating a junior when you are a senior. But my Junior year I went to prom with my boy toy Clark Draney. It was fun at the time. 22. Are you planning on going to your 10 year reunion? Yes. I think it is funny to see people from High School. Especially when they remember me and I don't remember them. I guess you can't forget a name like Covie! I tag everyone I went to high school with that read this. Or anyone who needs a laugh!